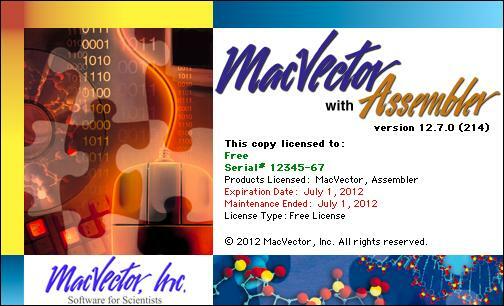 With all previous versions of MacVector, you had to have a valid license installed before MacVector would run. If you used a temporary trial license, then when the 21 days were up, MacVector would simply refuse to start unless you entered a new valid license code. With the release of MacVector 12.7 we have changed that behavior. Now, when the trial license (or any annual license) expires, MacVector will give you the option of continuing to work, but with reduced functionality. All of the functions in the Analyze menu become disabled, but you can still open, edit, save and print MacVector documents, or save MacVector files in other formats. You can also perform simple click cloning operations (but not the new Cloning Clipboard), generate new constructs and have full control over the appearance of features. Entrez and BLAST are also available along with the Find functionality. This will let licensed users share MacVector files and data with more casual users without having to convert sequences into a common format, often losing information (such as graphical appearance and layout) in the process. All of the functions in the File menu are available. You can create new documents, open sequences or alignments in any format supported by MacVector and save them in any format supported by MacVector. You can also print any view that supports printing (nearly all do). Everything in the Edit menu is fully functional. This means that you can cut, copy and paste sequence and alignment data as appropriate, reverse and/or complement sequences and change the case or color of residues. You can also use all of the Find functionality, to search for matching sequences, features or plain text in any MacVector view that supports Find. The Digest and Ligate functions are also active, so you can select restriction enzyme sites, Digest and then Ligate into a suitable site in a target vector to create new constructs. You can also Create new features from a selection, or by typing in co-ordinates, and you can Edit existing features. This includes being able to change the appearance of features, so you can adjust the graphical appearance of sequences just as you would with the full version of MacVector, prior to saving, printing or copying the graphics to another application. This is fully functional, as is the MacVector | Preferences menu, letting you customize the default appearance of MacVector and the graphical and textual display of sequences and alignments. None of the menu items in the Analyze menu are functional. This also means that toolbar buttons in individual windows or on the Analyses Toolbar are also disabled. So while you can open saved MSA documents or Align To Reference documents and edit them, you cannot (re)run the actual algorithms. This is the primary limitation in MacVector Free. Most of the items in this menu are fully functional. The exceptions are the Align to Folder and Auto Annotation functions. However, you CAN run the Internet BLAST and Internet Entrez functions and retrieve sequence hits from them just as you can with the full version. All items in the Windows menu are functional, with the exception of the Cloning Clipboard. You can arrange windows and have the ProofReader audibly playback sequence residues if you wish.